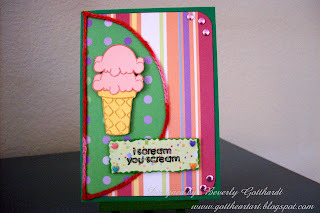 Supplies: Card Blank, The Paper Co. Value Pack, Hobby Lobby, pattern paper from scrap stash, pink, summer sun textured card stock, Inks: CTMH-Hollyhock, CTMH-Brown Bag, CTMH markers, Ranger Archival Ink-Jet Black, Stamps: CTMH-B1068 I Scream, Doodlebug Designs-CS4293 Doodlebug Birthday-T, Jo-Ann's-Metallic Dots, Remember When-Sticky Stitches, Making Memories-Pebble Brads, EK Success-Corner Rounder punch, pop dots. Another cute card and a great reminder to search my scraps for coordinating papers! This is too cute! 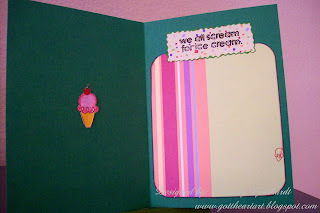 I love that ice cream cone! Thanks so much for sharing it with us at TPE this week!